How Far is Namitharaj Pallazio? Namitha Constructions presents Namitharaj Pallazio - a state of the art residential project located in Hyderabad. 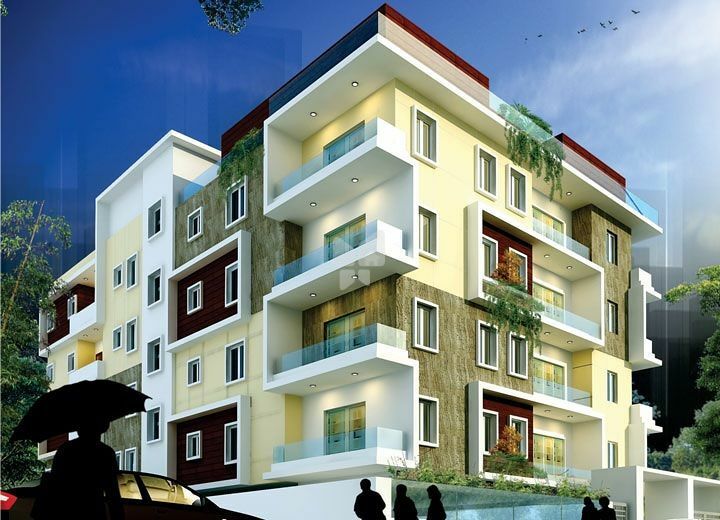 The project has lavishly built 3 BHK apartments with modern interiors. Basic amenities are an added bonus provided to residents. Connectivity to major schools, hospitals, railway stations, banks and shopping malls is easy via well laid roads. Table Molded Bricks in Cement Mortar. Concealed Copper Wiring with adequate points for TV, Exhaust Fans, Geyser, AC etc., with Finolex Cables, Legrand Switches, MCB will be provided in all flats. Standby Generator shall be provided. Colored Ceramic Tiles DADO up to 7ft height. Concealed Pipeline, Washbasin, Indian or European Commode matching with tiles, Jaguar/Grohe fittings and provision for Geyser in Toilets. Granite platform with steel sink, 2ft height Dado with tiles above the counter, Provision for exhaust fan suitable electrical points for Kitchen appliances. Full Back-up generators except for ACs & Geysers in all flats and common areas. Elevator of 6 Passengers Capacity with Stand by Generator. Make: KONE or equivalent. Telephone points and Cable TV points shall be provided in Livingroom and master bedroom. 24 hours Water Supply from Bore Well in addition to Municipal Water Supply with Storage Tanks of Suitable Capacity. Granite Flooring/Vertified tiles for Corridors and Staircase . Video-Intercom facility for all flats connecting to Main Security. NAMITHA builders is one of the fastest growing real estate enterprises in South India. Established in 2007 by Late Sri Ch. Srinivas, the company has crafted scores of lifestyle apartments, malls and multiplexes in premium locales. The pioneering efforts of the company are strengthened by a skilled team of engineers, architects, structural engineers, landscape designers and consultants in marketing and finance. On successful completion of several residential apartments the entrepreneurial spirit supported by extensive experience in real estate, culminated in the formation of a company, Namitha Constructions. The company quickly recognized the enormous scope for harnessing opportunities in real estate in Hyderabad and founders have led from the front to help the company grow exponentially.Today, Namitha Constructions is one of the fastest growing companies in the Realty Sector engaged in a whole range of constructions from apartments to commercial complexes, gated communities, villas, malls, hospital, multiplexes, etc. Each a work of creative ingenuity and skillful planning that has become a landmark and a worthy address to their occupants earning their appreciation. Our constructions have become synonymous with elegance, quality, affordability and delivery thus creating value for money. They have become a source of pride to us inspiring us to build even better constructions that will bring a feeling of pride and loads of happiness to our clients. Looking to the future, we aim to focus aggressively on growth markets and build capacities and capabilities focusing resources on our core strengths.